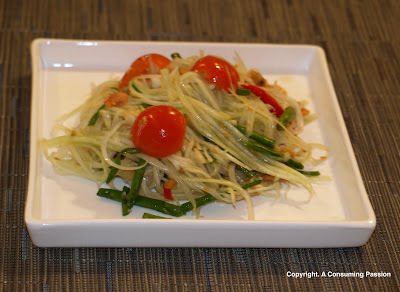 Anyone who's ever been to Thailand or a Thai restaurant for that matter, has probably had som tum, or green papaya salad. As in common in many Thai dishes, som tum is a mixture of salty, sweet, sour and spicy which makes it a perfect appetizer, in my opinion. The combination of flavours seems to open up your palate, as if to prepare you for what's to come. I'm a huge fan of Thai food, in general, and this salad, has got to be one of my favourites across all cuisines. I've made it several times for dinner parties and its always well received. The best thing is, its really not that hard to make either. Finding some of the ingredients outside of Asia can be challenging but since Thai food is so popular globally, its becoming increasingly common to be able to buy things like lemongrass stalks and galangal (also known as blue ginger). If you've never tried this, I highly recommend it. Watch the chilies though, they can get really spicy! Divide the garlic, chilies, and dried prawns into 2 batches. Put half into a mortar, add 1 tsp of sugar into a mortar and pound until well broken up. Add half of the long beans and pound a little to bruise, then add half of the chopped tomato and pound a few times just until they are broken up. Add half the papaya to a mortar, a little at a time, pounding until lightly bruised. Transfer the mixture to a bowl and repeat with the remaining garlic, chilies, dried prawns, sugar, tomato, beans, and papaya. Add the fish sauce, lime juice, and peanuts to the bowl of papaya mixture, tossing to mix well. Taste and add a little more lime juice, fish sauce, or sugar if you like, and serve immediately. I was curious where you got green papaya in London? I've been thinking about making this for ages but never found the papaya!